Grab a mint julip and don your best and most elaborate hat for this fun and truly southern event that takes place at one of the most enchanting destinations on the Outer Banks. The Kentucky Derby Party is a festive celebration that is held at the famed Elizabethan Gardens, and which features a host of revels and embellishments to coincide with the annual race, and which will benefit a number of worthy local causes. Come enjoy the spirit of the Easter holiday on the Outer Banks while taking advantage of National Kite Month at this fun and family-friendly event that joyfully combines these two celebrations. The Flying Into Spring And Easter EGGstravaganza festival is a great way to take in the fresh spring air along the coastline, while participating in a myriad of games, displays, and a little kite action at one of the best spots on the East Coast for high flying. The 47th Annual Hang Gliding Spectacular and Air Show is landing on the Outer Banks, and visitors are welcome to take flight on a new adventure and join in the fun. Renowned as the longest running hang gliding competition in the world, the Hang Gliding Spectacular and Air Show is a multiple day event that combines a wealth of activities for professional hang gliders and spectators alike. The incredible air show is the cornerstone of the event, and visitors can head to the sky high dunes of Jockey’s Ridge State Park to check out the action. Throughout the day, an incredible display of colorful gliders will fly overhead, and lots of fun will be had at ground level as well thanks to a host of activities for competitors and everyday sightseers alike. Known as the crown jewel of wakestyle kiteboarding competition all around the world, the Triple-S Invitational is one of the best opportunities for Outer Banks visitors to see the world’s best boarders compete in one of the most heated and spectacular competitions on the beach. Held over the course of 7 days on Hatteras Island – which is renowned as one of the top kiteboarding destinations in the world – the Triple-S tournament pits the most famous kiteboarders on the planet against each other in a high-stakes event that promises plenty of aerial acrobatics and amazing displays of skills and agility. Make the most out of Monday evenings and celebrate your inner mermaid with this unique summertime festival that features lots of ways to have a ball. The Sunset Festival Mermaid Mondays event is held weekly in the summer months on the edge of Jockey’s Ridge Crossing, and features ample opportunities to shop, dine, and enjoy one of the best natural outdoor shows on the Outer Banks. Take a break from the sunny Outer Banks beaches and indulge in a morning of fun and free activities that kids of all ages will adore at this weekly summertime event that launches from the Kitty Hawk Kites store in the heart of Duck. Kids Days is held every Tuesday in the summer months, and is a great chance for kids to explore all the fun things there is to do both on and off the sand, through a wide array of arts and crafts, games, and other activities that will leave everyone smiling. The Rogallo Kite Festival is a free and family-orientated event that features two days of kite flying to honor Francis Rogallo, NASA scientist and inventor of the flexible wing. His initial inventions started the sport of hang gliding, and his designs have carried over into the stunt kites, power kites and hang gliders that are flown today. To celebrate this innovator, visitors will be treated to a full day of kite-flying fun in one of the best destinations on the East Coast for high flyers, Jockey’s Ridge State Park. The Outer Banks has a rich sailing culture that seemingly begins and ends in Manteo, and young visitors who want to join in the fun, and who want to get their toes wet in a new sport, can sign up for the weekly Summer Youth Sailing Camp which is held every Friday all summer long. Take a step back in time to the Outer Banks of the mid-1800s, and celebrate Independence Day in a historical fashion, with a visit to The Island Farm. Located in the heart of Manteo, The Island Farm is a unique attraction that takes visitors on a tour of what life was like for island residents more than 150 years ago. Featuring a wealth of historic homes with period artifacts, live farm animals, and costumed interpreters who explain what life was like for these original locals, The Island Farm is both an educational and utterly fascinating attraction for visitors of all ages. The Town of Manteo will host an incredible display of fireworks over the water on 4th of July that will make any Independence Day celebration truly memorable. Launched over the Roanoke Sound and Shallowbag Bay, visitors can find a spot along the downtown docks or a seat at the famed Roanoke Island Festival Park to catch an incredible show with a stunning backdrop. Head to the heart of Nags head for this special 4th of July fireworks display over the Atlantic Ocean that will leave all beach-goers breathless. The Town Of Nags Head Fireworks Spectacular will be held on the evening of Independence Day, and is sure to be a show-stopping aspect of any Outer Banks vacation. Young visitors can enjoy a full week of fishing at some of the hottest spots in the central Outer Banks at this day camp that’s designed for budding anglers. The Fisherman’s Camp, which is orchestrated by the North Carolina Aquarium at Roanoke Island, will feature a full week of fishing from local piers, the surf, and the sound waters, and will hopefully result in plenty of great “fish stories” for everyone involved. Make a calm and quiet Hatteras Island evening a little brighter with this special event along the waterfront in Rodanthe. Light up the Night, which is hosted by the soundfront Kitty Hawk Kites Store, will feature a collection of activities, games, and even an outdoor movie under the stars, and will shine a spotlight on how cool Hatteras Island can be after hours. The Elizabethan Gardens celebrates the birth of Virginia Dare, the first English child born in the New World, with special discounted rates on admission to the gardens, as well as a wealth of activities that will delight young and old visitors alike. On Virginia Dare's Birthday, the rate to enter the gardens will drop with $2 off admission to commemorate Virginia's 431st birthday in 2019. 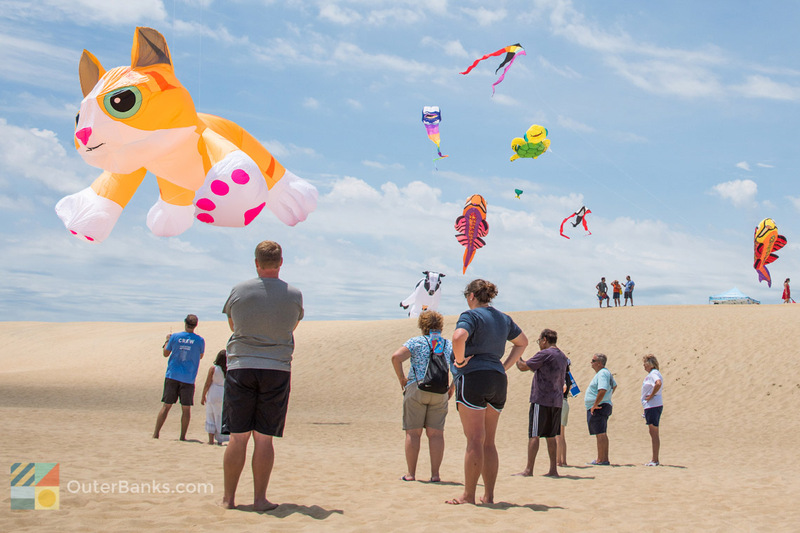 Enjoy a thrilling scene along the towering sand dunes of Jockey’s Ridge State Park as giant kites and stunt kite pilots wow the crowd at the engaging and family-friendly Outer Banks Kite Festival. Hosted by Kitty Hawk Kites, this festival features both live demonstrations and interactive activities to ensure that everyone can have a ball enjoying the high flying lifestyle on the Outer Banks. Come celebrate the history and culture of Hatteras Island’s working watermen at this annual event in the heart of Hatteras Village that has become a tradition for fall visitors and locals alike. Day at the Dock takes place along the waterfront that’s adjacent to the village marinas, and is a delightful combination of fresh seafood and good eats, live demonstrations, working commercial fishing boats, live music, kids activities, and more, and is a true and authentic sample of what life on Hatteras Island is all about. Celebrate the fall season at one of the prettiest outdoor attractions in the heart of Roanoke Island with this special weekly event that has become a favorite activity for locals and fall visitors alike. Pumpkin Patch Saturdays are a fantastic opportunity for kids and adults to pick up their own Halloween pumpkins while exploring a myriad of activities and attractions found within the Island Farm. The Outer Banks, and the Pea Island National Wildlife Refuge in particular, is known as one of the best bird watching destinations in the world, and the annual Wings Over Water celebrates this distinction like no other local festival. The weeklong event, which is held each October, features a wide range of educational programs, lectures, and opportunities to meet and greet with fellow birders. During this year's festival, attendees will also have the opportunity to go on guided birding trips, attend art and photography workshops, take a tram or kayak tour of National Wildlife Refuge, visit an ancient maritime forest, and much, much more. A complete schedule can be found online at the organization's website, and attendees should note that some programs do cost a small fee to participate. A celebration of flight and beer, OBX Brewtag is modeled after the whimsical and entertaining Red Bull Flutag, translated to “flying day” in German. With OBX Brewtag, the general premise is the same, although rather than human-powered flying machines, Brewtag contestants will be competing to see who can launch and fly an empty 1/6 keg barrel the furthest. The cost to compete at OBX Brewtag in 2019 is only $50 and the sky is the limit as to how creative your homemade flying contraption can be! Individuals and teams are welcome. Admission to the event is FREE to the general public. A rather crafty selection of local and regional beer and food will be available for purchase that day. This family-friendly event will also feature plenty of activities for the kiddos! Ignite your holiday spirit with this special annual event that combines the natural beauty of the Outer Banks with twinkling Christmas lights for an unforgettable display and seasonal experience. The Hangin' With Santa & Kites With Lights event is hosted by the flagship Kitty Hawk Kites store that’s just across the street from Jockey’s Ridge State Park, and the beautiful landscape of twinkling kites with the iconic massive sand dunes of the park in the background will be a sight that spectators won’t soon forget. Ring in the holidays island-style with this seasonal parade that takes place on the waters that surrounds Ocracoke village. The Ocracoke Parade of Boats is a celebration of life on the water, and this annual procession of ships of all shapes and sizes is sure to make anyone fall in love with the coastal scene and community that calls Ocracoke Island home. Visitors who missed the annual Wings Over Water festival - or who just want a second opportunity to admire the hundreds and thousands of birds that flock to the Outer Banks – won’t want to miss this special weekend where these feathered visitors are once again in the spotlight. The Wings Over Water Encore event is a weekend-long celebration of the many wintering waterfowl that are found at the Pea Island National Wildlife Refuge and beyond, and is a great way for birders to discover the off-season beauty of the OBX. Rooster’s Southern Kitchen is the culmination of lifelong experiences of Sue and John Woolard, a couple born and raised in Eastern North Carolina. Growing up in a rural culture, Sue and John believe in the value of opening their doors to friends and neighbors, and they also believe in that good food comes straight from the field to the table. After twenty-five years operating a franchise restaurant, they were ready for a change. Their desire was to create a place where locals and visitors alike could gather to enjoy incredible food, drink, and conversation—either as a party of two or for a big reunion. Sue and John have teamed up with executive Chef Ray Fiorello and General Manager Michelle Parrish to bring you hand crafted Southern food that you will talk about for days.Rooster’s Southern Kitchen’s infectious atmosphere centers around a dynamic kitchen that works hard to bring you the very best in local cuisine—every time. Each space in the restaurant is stylishly appointed to reflect the culture and energy of both the South and the Outer Banks. Don't miss our delicious Weekend Brunch, starting at 10am on both Saturdays and Sundays! If it’s not food you want, come join us for craft cocktails and regional brews from our twenty-tap bar. Your toes will groove with the rhythm of local musicians who visit us nightly.